The Handmaid's Tale, a Hulu series about a dystopian society where women are forcibly impregnated by the agents of a totalitarian regime, was always a somewhat questionable candidate for an honorary wine. But despite the unseemly marriage of fermented grapes and misery, wine-seller Lot 18 and Metro Goldwyn Mayer pressed on with the exceedingly weird product, and released a Handmaid's Tale wine earlier this week. But the fruit was cursed, rather than blessed: After several hours of relentless skewering on the internet, the Handmaid's Tale wine was abruptly pulled from the market. The three varietals produced -- two reds for characters played by Alexis Bledel (Ofglen) and Elisabeth Moss (Offred), and a white for Yvonne Strahovski's character Serena Joy -- couldn't escape their association with themes of apocalypse and female subjugation expressed on the show. But hey, at least that marketing copy shined, as a cached version of Lot 18's now-defunct listing uses some zesty language to describe the wines: "The French Pinot Noir is smooth, earthy, and similarly seductive in profile to Offred, who must use her feminine wiles to stay ahead of the game. The Cabernet Sauvignon, like Ofglen, is a daring testament to the heights that Oregon Cabs can reach." 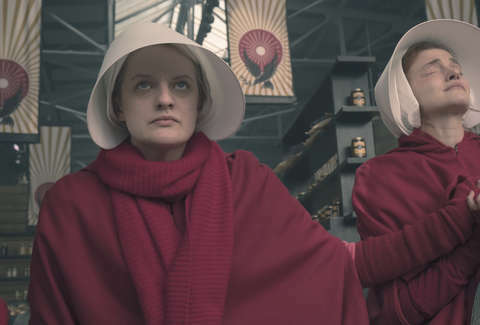 The season 2 finale of the Handmaid's Tale aired Wednesday night, albeit without any of its own wine pairings.